T-26c is highly potent and selective matrix metalloproteinase-13 (MMP-13) inhibitor with an IC50 of 6.75 pM and more than 2600-fold selectivity over the other related metalloenzymes. 6-Epi Doxycycline is one of the Doxycycline decomposition products. Salvianolic acid A could protect the blood brain barrier through matrix metallopeptidase 9 (MMP-9) inhibition and anti-inflammation. Bisdemethoxycurcumin is a natural derivative of curcumin with anti-inflammatory and anti-cancer activities. S-methyl-KE-298 is an active metabolite of KE-298. 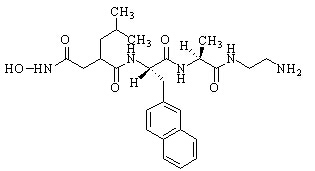 Esonarimod is an antirheumatic drug. 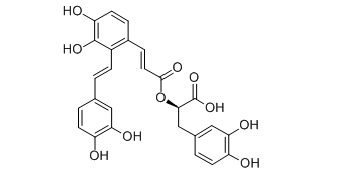 JNJ0966 is a highly selective MMP-9 zymogen inhibitor with an IC50 of 440 nM. 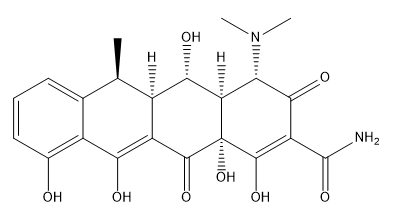 TAPI-1 is and inhibitor of TACE. It inhibits the cleavage of TNF-a, TNFRI (p60), and TNFRII (p80). Ginkgolide C is a flavone isolated from Ginkgo biloba leaves, possessing multiple biological functions, such as decreasing platelet aggregation and ameliorating Alzheimer disease.